Geo segmentation is used to segment your subscriber on the basis of their geo location. Geo segmentation pick the location of the subscriber on the basis of their IP location and insert the location to the custom fields. The segmentation is allowed on the segment page on the basis of their city, state and country. The segmentation can be used during the campaign creation process. Note: The results may vary from actual location due to email service providers (esp. Gmail mailbox locations). The system is dependent on the information provided by the subscriber device. The immediate location can be tracked from web froms and api call. Step 1: Create three new custom fields as geocountry field, geocity field and geostate field. 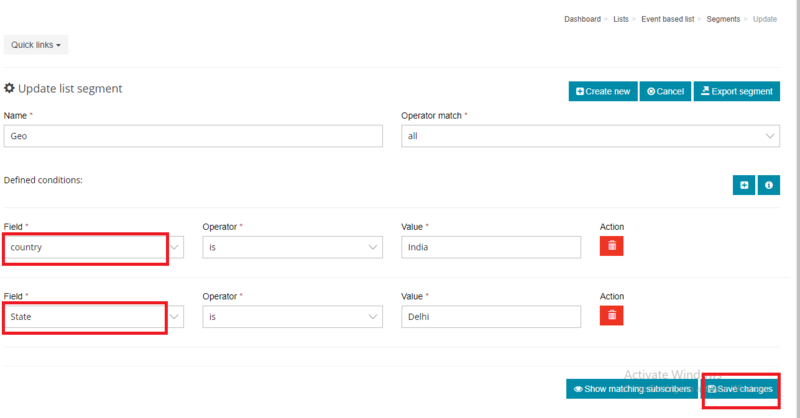 Step 2: After the subscriber has been added to the list you can create segment on the basis of city, state and country. Step 3. Now you can apply the segment condition during campaign creation process.